I recently had the opportunity to view the documentary, Divided We Fall while in Madison, Wisconsin. The insightful documentary is the maiden project of Katherine Acosta who was present with her crew to facilitate the post-screening discussion. I had a couple of flashbacks that I’d like to share with you. But first, let me tell you what the film is about and why I think it can be a valuable addition to the discussion progressives are having in response to trump’s new world. The documentary is a deep dive into the resistance to Wisconsin Governor Scott Walker’s Act 10. Like most uprisings, it not the one thing that sparks the inferno, it’s a series of things that accumulate until The People can’t take it anymore. Act 10 was that thing that ignited the flame. Act 10 was part of the Republican playbook to undermine unions and the Labor Movement. To address a nearly $4 billion deficit, the Republican Governor and his cronies in the state legislature decided to target bargaining rights, wages and benefits of public sector employees. Governor Walker unapologetically stated his strategy would be divide-and-conquer, to kick up the tensions between rural and urban citizens. 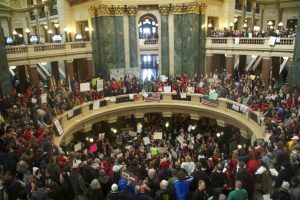 The narrative became the “greedy” public sector workers in the cities were the reason Wisconsin’s small towns were suffering. Dubbed the “largest sustained protest in US history” filmmaker Acosta accessed compelling archival footage from inside the inside of the organic resistance. This helped to give viewers a front row seat into the strategizing and organizing actions going on at the Capitol during the two weeks of resistance. At its height, up to 100,000 people from across different backgrounds and affiliations united to make their voices heard. I can remember following the actions from St. Louis and rooting on the protestors including the 14 Democratic Senators in the Senate who left the state as a tactic to stall the vote on Act 10. My first flashback was seeing the chaos as thousands converged on the Capitol Building. It was reminiscent of the Ferguson Uprising. You are literally in the fire trying to bring organization to the situation and to figure out strategy simultaneously. The generous material support from across the nation also struck a nerve. My second flashback was seeing the treacherous actions of three major unions—American Federation of State, County and Municipal Employees (AFSCME), Service Employees International Union (SEIU) and Wisconsin Education Association Council (WEAC). John Matthews, head of Madison Teachers Inc., criticized the sell-out decision “pulled the rug out” of the mass action. MTI had already led a successful teacher walk-out in response to Act 10. Many were hoping it was the beginning of a general strike if other unions joined in. In 1964, the Mississippi Democratic Freedom Party (MDFP) led by the uncompromising Fannie Lou Hamer, took their 68-member delegation to the Democratic National Convention and demanded to be seated. Instead the Democratic Party proposed two at-large seats to the convention with no voting privileges. Seeing the power of this delegation and its impact on the South if successful, a united front from then President Lyndon B. Johnson to Walter Reuther was hastily assembled. Reuther, president of the United Auto Workers (UAW) was recruited by the White House to put pressure of the MFDP delegation to accept the compromise. The powerful union leader threatened political retaliation of MFDP members and supporters if they didn’t accept the Democratic National Convention’s offer. The threats didn’t stop there. Joseph Rauh, who was the attorney for both the UAW and the MFDP, was told he would be fired if he broke ranks. He fell in line as sadly did Dr. Martin Luther King who was threatened with loss of funds for his work if he didn’t support the compromise. That’s at least twice at historical junctures that unions and Democrats colluded to maintain white supremacy and sabotaged the struggle for Black political power and self-determination. I’m sure there are other examples, more local or regional, that others can add but the point is that both the Labor Movement and the Democratic Party are in dire need of racial introspection and transformation. In building our own united front against Trump, we don’t need to repeat the ugly, racist mistakes of the past. We need a re-alignment of social forces who are uncompromising on principles – like the Mississippi Democratic Freedom Party. Act 10 was eventually passed. The massive recall campaign against Gov. Walker failed. The Democratic candidate who ran against Walker lost. Acosta is not shy about exposing the undermining roles of the unions and the Democratic Party. Neither does she try to shield the internal struggles of organizers, particularly the Teachers Assistants Association (TAA), to keep it all together. There are lessons to be learned from the Wisconsin Uprising just as there are from the Ferguson Uprising. The new US president has made it clear that our learning curve must be short as he puts his neo-fascist policies and laws in place. We must start racking up some victories. Finally, there must be a radical transformation of our social justice movements from labor to faith if we are to build a formidable united front that centers on trust and a shared vision for democracy and justice. Otherwise divided, we fall. Every time.